Add Module to Store - In the Miva Merchant Admin, click the plus next to Global Settings. Then click the [Add] link next to modules. If you want your newsletter signup box globally (like in your global header/footer) then you will need to manually assign the mailchimp item to the rest of your pages in your store. Assign the Item to all Pages (if necessary) - Click on pages then the items tab. Scroll down until you see the mailchimp item and click the edit button on the far right. Next, click on the pages tab. Click the check plus in the header of the check box column to assign the item to all pages. Scroll to the bottom and hit update to save. Assign the Module to your Store - The last step is to assign the module to your store. From the left menu click on Utilities. On the right side check the box for MailChimp - Newsletter Signup. Click Update to save. This will add a new tab to your Utilities page named MailChimp Newsletter Signup. The textbox item outputs the HTML for the newsletter signup box. This item can be put on any individual page template where you want to newsletter signup box to go, or if you want your newsletter signup box globaly, then you would typically put this item in your global footer. The checkbox item is only used on OCST (the customer bill to / ship to page). 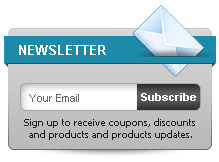 This will add a checkbox during checkout for customers to simply check to add themselves to your newsletter. Installation Instructions for adding checkbox during checkout. If you are on CSSUI, look for this code. Place the item right below it. Additionally if you have a customized checkout on CSSUI verify you still have these three ids above in red. 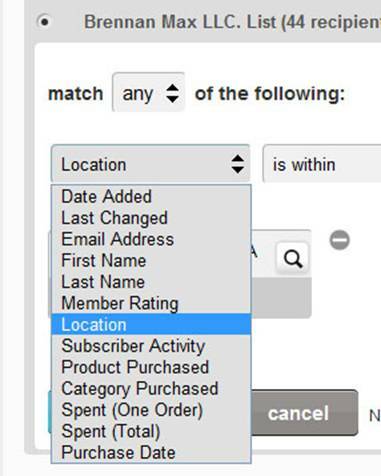 The checkbox functionality during checkout will not work without them. The CSS styles are setup for a default installation of CSSUI. You may have to modify the styles to get the positioning correct. 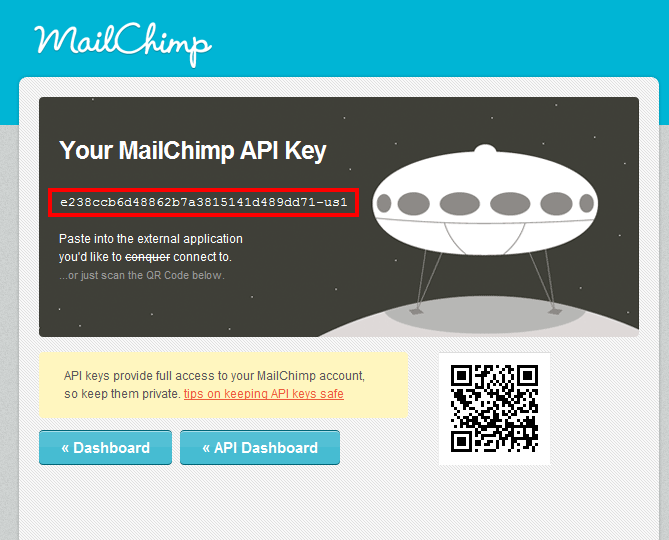 The MailChimp API key allows the module to talk to your MailChimp account and add and remove subscribers. This is required before you can use this module. MailChimp makes this easy to get. Click the "Get Your API Key" link. This will take you to the MailChimp website where it will ask you to login to your account. After you login you will see this screen which contains your API Key. Enter this API key into the module admin and click update to save. 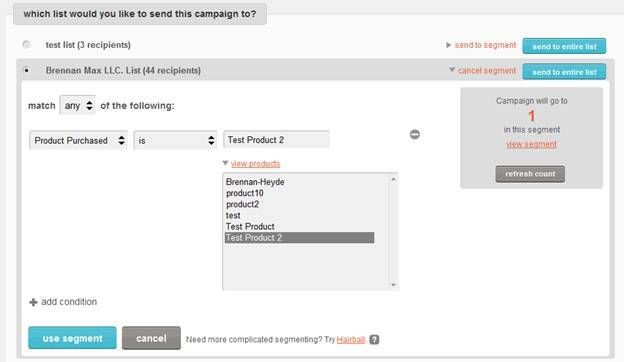 After you've successfully enter your API key, a new select drop down will appear called "Select List"
The loading graphic is the animated gif that appears while the module is communicating with MailChimp to add or remove subscribers. This is not required, but it lets the user know that there is something happening. Typically response times are about 1 to 2 seconds. The module comes with a default graphic which you need to upload or you can choose your own to fit your site. Each of these sections have full version control so any changes can be easily rolled back. You also will always have an easy way to get back to the original template for each section in case you want to revert back to the default. You will see that the module references a mailchimp-style.css and a mailchimp-js.js file. Each of these files are automatically created upon installation of the module. You shouldn't need to edit these paths, however if you prefer to move these files into a different location you have access to do so. The /mm5/ may be different for your particular store, but the module will automatically adjust for that. Every time you make an update in the admin to the css section under Advanced Settings the file automatically gets updated. No need to FTP the changes the stylesheet. It can be completely edited from the admin. The CSS selectors are overly specific on purpose to avoid any conflicts with commonly used ids and classes. //Success Message. Message that fades in once the user has successfully been subscribed. //Unsubscribe Message. Message that shows up when a user has removed their email from your mailing list. //This is the color that will be used for both the subscribe and unsubscribe error messages. The module will automatically look for this id and if it exists in the url it will save it as a cookie so it can later be accessed if an order is placed and sent to MailChimp. 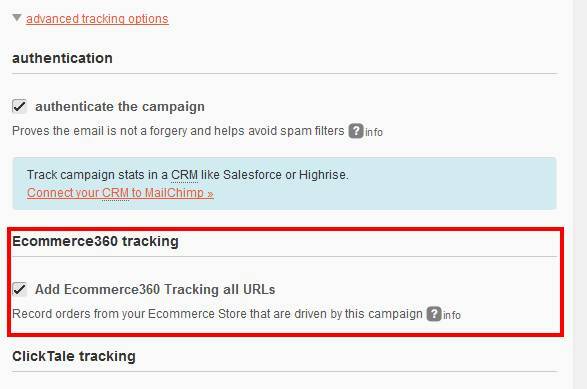 When a customer clicks on an email campaign link and also places an order, the contents of that order are sent back to MailChimp. This does two very useful things. It allows you to see how much money that email campaign generated and also you can then use MailChimp to create filters on your customers based on what they have purchased in the past. Important Note: One important thing to note about the ecommerce data that gets sent to MailChimp is if a customer is not subscribed to your list, their order data is still sent to MailChimp. However, they will not show up in any of your filters unless they subscribe to your mailing list. 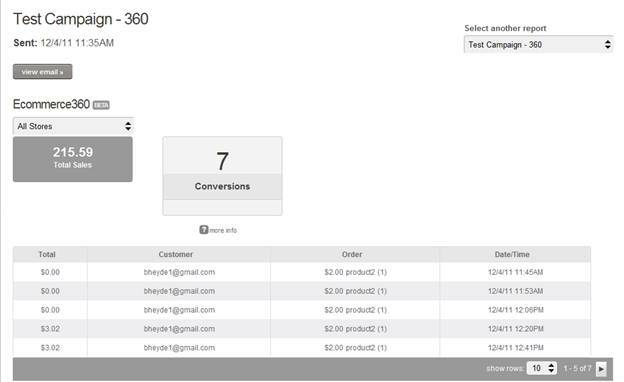 Once they do subscribe, MailChimp will have all their past order history and you will be able to use this data in future email campaign filters you create. There is an error log that gets written to the root Miva Data folder named mailchimp_error.log. It is used for recording any errors that may happen for the ecommerce360 integration. If the e-commerce data is not being sent to MailChimp this error log should be able to tell you what the problem is. Remove the item code from all pages. There are three items available to the module. Go into any page template that references these items and delete the code from the pages. Unassign Items - Click on pages, then the Items tab. Edit the mailchimp item then unassign it from all pages. Unassign the module from the store - Click utilities. Uncheck the Mailchimp Newsletter Signup module. Expand Global Settings and click on modules. Find the mailchimp module and delete it. The steps must be followed in that order for the module to uninstall successfully.